Sale, Sale and Sale we are listing this sound from every corner. In Pakistan the sale & discount become’s the part of there marketing strategy to attract more and more customers. The branded shop offers different kind of sales throughout the year. It might be season end sale, summer sale, winter sale, anniversary sale, Eid sale or Azadi sale. These sales remains almost for complete year. So that they can attract more customers and to sell their out season products to welcome new stock. ChenOne a brand owned by Chenab Textile announced flat 50% on their complete/entire stock. The entire stock may contain clothing, household items, bed sheets, pillows, pillows cover, quilt cover, lawn suits, kids clothes, jeans and many more. The ChenOne 19th anniversary sale will begin from 29th September 2016 to 2nd October 2016. And it will remain for complete 4 days. But we have seen many times these sale will remain now almost whole year. That are just their strategies to attract people and sell their products. So, if you want to buy sale items then visit your nearest ChenOne store or buy online at there website. 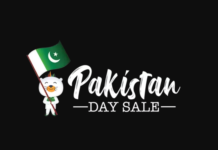 Also check other brands for sale, now almost every brand are giving different type of discount on different product range.